David Hawkins: A Battle of the Mind was shortlisted for the AHRC’s Best Research Film of the Year Award, 2017. Hawkins’ life story brings together many strands in the history of ‘brainwashing’. He was born in Oklahoma in August 1934 and had a difficult childhood, as he relayed to us in the film. David was pleased to escape from home into the army, only to find himself at the eye of a Cold War storm. He spent four years living in China. There, he attended university, and learned Mandarin. He married, and worked as a truck and coach driver. In 1957, he returned to the US amid intense media scrutiny, and to face an image of himself that he did not recognise. Above all, he struggled to make sense of the claim that he had been ‘brainwashed’ by Chinese communists. ‘Brainwashing’ was not a term he encountered on first leaving for China. It became a notorious term in the US, however, and by the time Hawkins returned in 1957, it was central to the way he was understood by skeptical journalists and other inquisitors. It conjured not only images of nefarious communists indoctrinating the masses, but also psychological techniques of conversion and control. ‘Brainwashing’ could also denote the seeming vulnerabilities of Americans to communist takeover. Indeed, whilst Hawkins had lived in China, he and his fellow ‘turncoat’ POWs became the subject of American popular debate. Questions abounded at the time: what kinds of torture and coercion would cause American boys to collaborate with communists? What sorts of deficiencies in spiritual and moral upbringing might lead a young GI to betray his country? Several popular texts – such as Virginia Paisley’s 21 Stayed (1955) and Edward Hunter’s Brainwashing: The Story of Men Who Defied It (1956) – argued that American POWs like David Hawkins had joined with their communist captors because they lacked the inner strength to resist. Such allegations were near their peak in 1957. They would be depicted, and to some extent caricatured, in Richard Condon’s novel The Manchurian Candidate, published in 1959 and famously made into a film in 1962. I was introduced to David’s story when the Hidden Persuaders group suggested that I watch a popular television programme in which Hawkins featured. He was interviewed on the Mike Wallace show in 1957 when he returned to America. 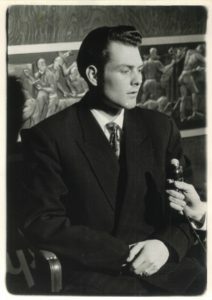 The interview is stored at the Harry Ransom Archive in Texas and available to watch online (along with a whole host of other fascinating and disturbing conversations with figures ranging from Aldous Huxley to Philip Wylie, coiner of the term ‘momism’, to the head of the KKK – in full regalia) on their website. On watching the interview with Hawkins I was impressed by several things, most immediately David’s character – his good humour, wit and intelligence on camera. These features were in strong contrast with media accounts of him and his life. I was also struck by the hostility and objectification that characterised the interviewer’s approach to David. There is a particular irony to this interview too: even as it stoked fears about brainwashing, the programme itself was sponsored by Phillip Morris, and laced with aggressive advertising for smoking. The interview spoke to me about some of the paradoxes and tensions in mind control debates during the long Cold War, and its legacies today. In making the film, my editor Yann Heckmann and I worked with the Mike Wallace interview, and a rich telephone interview that the Hidden Persuaders research group had conducted with David. We combined this material with a wealth of found archival footage. For me, it was vital at every stage of the process to keep David at the very centre of the film, and to help the viewer empathise with his experiences of bewilderment, isolation, even confusion. This kind of empathy felt like it was missing from 1950s media accounts of his story, and as a storyteller it felt like the key to bringing this particular historical research to life for a contemporary viewer. Given that David Hawkins is the centre of the film, it was a real bonus that we had the opportunity to gain a live interview with him on camera. We have been able to use some of this footage in our current film, and look forward to using more of this valuable first hand testimony about the reality and rhetoric of the Cold War in further work. Meeting David Hawkins in person was fascinating. Well into his 80s, he is witty, curious and full of questions about his own life and the political reality he negotiated. Making a documentary about his life felt like an important responsibility; it was crucial to try and convey his state of mind at every stage of his complex story. It also gave me the opportunity to reflect on themes of violence and trauma, past and present, that interest me as a filmmaker. Collaborating with a group of historian researchers has been a wonderful experience. Their critical thinking and method provided us with a rich seam to mine for inspiration, and a valuable sounding board. The history of ‘brainwashing’ as an idea during the Cold War is full of remarkable stories and characters that prove beyond doubt that sometimes truth really is much stranger – and more telling – than fiction. Nasheed Qamar Faruqi is a Pakistani woman and filmmaker who grew up in London. She writes and direct stories, both documentary and fiction, about the impact of violence on our lives; she is moved to understand characters and places that witness and survive violation and betrayal. She goes against the grain of stories about a “clash of civilisations”, and explore our world as she sees it: full of grey areas and nuance. Her film David Hawkins: A Battle of the Mind will be available on the Hidden Persuaders website in March 2018.